As many other dogs in the same breed, the Bernedoodles have different looks from one another, due to the parent genes combining each time in an unique manner. People planning on getting such a dog should be aware of this and only reputable breeders can truly help in identifying a Bernedoodle that matches what the potential owner wants. As in general with cross breeds, the puppy can gather all the positive traits in the parents, being friendly to both the owners and other pets, sociable and playful and, of course, a lot of fun. Due to them getting along very well with people of all ages, they can also be used as therapy dogs, especially because they are easily trainable. Before actually getting such a dog, it’s important to be aware of the efforts and time that need to be invested in the training and also it’s important to take this responsibility of teaching the dog right from wrong. Proper training prevents a lot of unwanted situations and makes this sociable dog, as well as the owner, happier. People with allergies are potential victims of the allergens coming from the dogs as well and this is also related to the level of shedding. Usually, a dog with a straight coat will shed more than one with a curly coat, but the same hybrid dog can inherit any time of coat. The Bernedoodles inheriting more coat characteristics from the Berne parents will have an almost straight coat, having only slight waves. They will shed the most from the Bernedoodle breed, even if less than the Bernes. Most of the Bernedoodles have a wavy coat and they don’t shed too much. They will be pretty safe for the people with allergies, as they most probably won’t react to them. 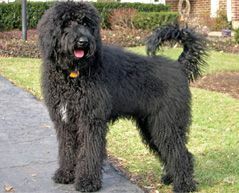 The curly coat is a heritage from the Poodle side of the bloodline and Bernedoodles with this type of coat won’t shed. They will be easy to deal with if the owners were also good with Poodles. However, despite the lower level of shedding, if one has allergy to dog saliva, this type of dog will be a problem anyway. Breeders are generally very helpful when it comes to allergies, being able to advise about the nature and the probability of problems occurring. They may even allow you to return a puppy if it proves to be causing allergy issues. Dealing with a curly Bernedoodle may be a bit time consuming and require a certain level of efforts when it comes to grooming. Although they shed quite little or not at all, they will require clipping every three to four months and frequent brushing in order to prevent the occurrence of mats. Depending on the information passed on from the parents, the Bernedoodle will come in different sizes. As the poodle can be of three types – standard, toy and miniature, the estimated weight and height for each of them crossed with a Bernese are as follows: about 23 kilos and 54 centimeters for a Bernedoolde with a standard Poodle parent, the toy Poodle crossed with mini Bernedoodle will have about 10 kilos and no more than 35 centimeters height and one with miniature Poodle as parent will have at most 21 kilos and up to 50 centimeters height. In all cases the females are slightly smaller than males. 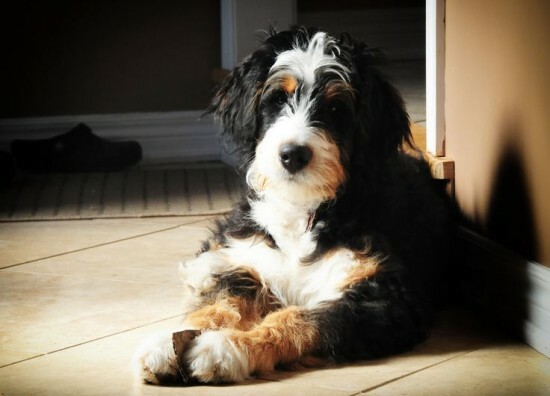 A Bernedoodle coat’s color is most often black, but there are also a series of combinations of black with white and brown or only white and black. The F1 generation of the Bernedoodle is in fact the first generation of this crossed breed, with 50% presence for each Bernese and Poodle parents’ genes. It is believed that this generation is also the healthiest. The F1B generation has more Poodle genes than Bernese, the balance being 75% for Poodle and only 25% for the Bernese. The main trait of this generation is the reduce allergy risk and a very low shedding level. 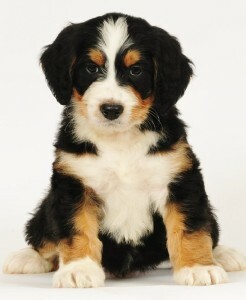 There have also been crosses between a Bernedoodle and a Bernese, changing the proportions in the resulting puppy. 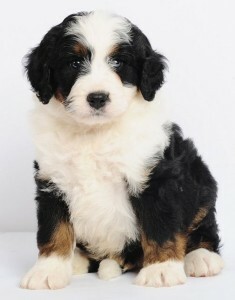 F2 generation is the generation resulted from the cross between two Bernedoodles in the F1 generation. This could even be registered as a purebred if the mixing is successfully made for at least seven generations. The sole disadvantage of making it a purebred is that the genetic issues may reoccur, as the vigor belonging to a hybrid vanishes or at least very much diminishes. The softness of the coat may also disappear. For a purebred is mandatory to have a consistence in appearance and traits need to be maintain from a generation to another, while the mixed breeds have a certain degree of surprise in the look of a puppy. Even so, an experienced breeder would normally be able to estimate the appearance of the puppy when it becomes adult based on past experiences. Even if on the overall the Bernedoodle has fewer health problems than any of his parents, it is still a breed prone to some conditions, such as the hip or elbow dysplasia and certain skin problems. Having the dog tested at a very early stage is a good way to identify existing or potential health issues and also can help prevent at least part of them. Any reputable breeder will carry out tests to ensure and prove good results. This is something that needs to be carefully considered by people interested in getting such a dog, that the breeder’s level of care and professionalism can be a good way to know that the money paid for a puppy is a safe investment; it is worth even if such breeders are usually a bit more expensive. This entry was posted in Bernese Mountain Dog Mix, Poodle Mix. Bookmark the permalink. I saw a dog the other day who looks a bit like this and has Labrador looking eyes. He had patches of ginger and white all over him and was quite curly. Does anyone have an idea what breed it could be? I saw a dog the other day who looks a bit like this and has Labrador looking eyes. He had patches of ginger and white all over him and was quite curly. Does anyone have an idea what breed it could be?? ?